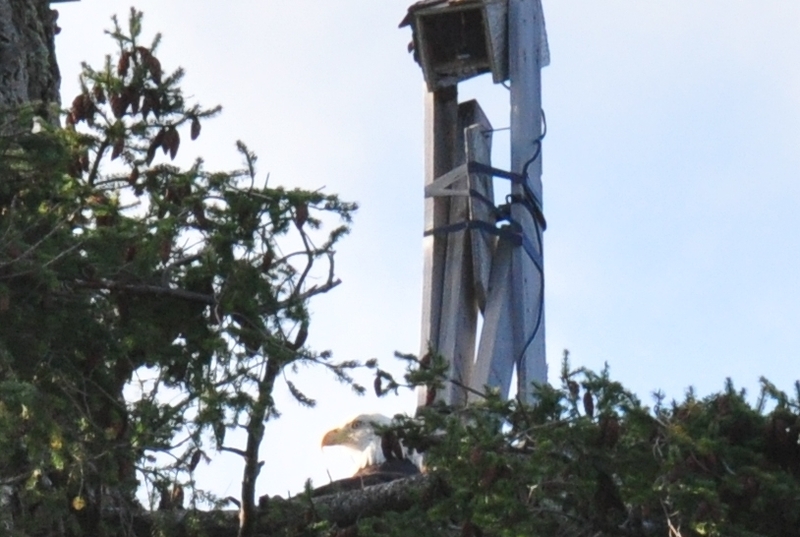 This is the place for posting photos of the nest and eagles taken from the ground. 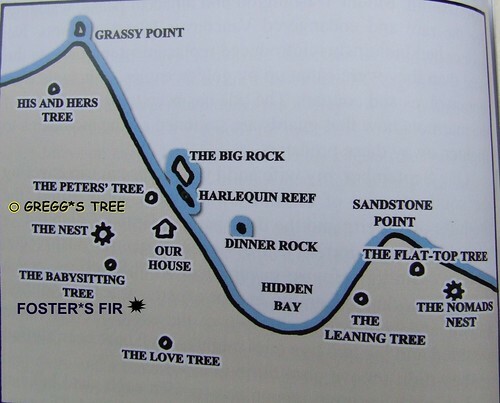 Here is Doug*s map of the nest tree neighbourhood from page 28 of his book. i*ve modified it to inlcude Foster*s Fir & Gregg*s Tree. 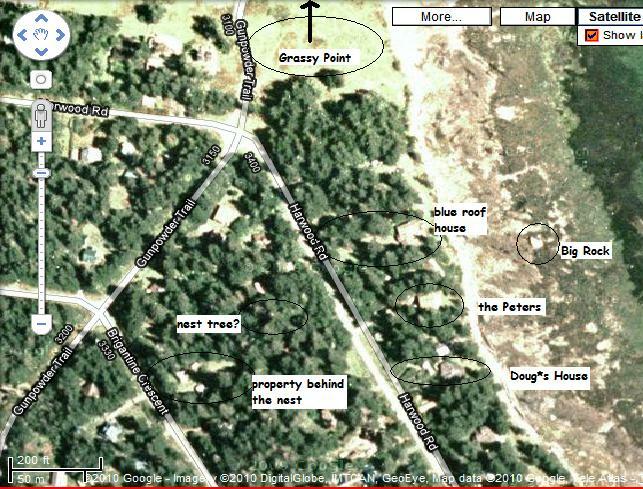 Here is a modified version of the Google Earth map for the nest tree neighbourhood. i have labelled what i believe to be what. It was suggested in the chat that we post a foto of the trees visible from the close up cam, so that everybody knows what tree is what & what they are called. 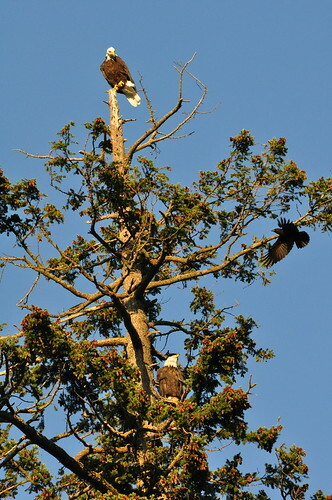 Thanks to Raptorman for the screen cap & the numbering of the trees. Click on foto to view it in a larger size. i just got back from taking Dooki for his morning bike ride. We went to Grassy Point. 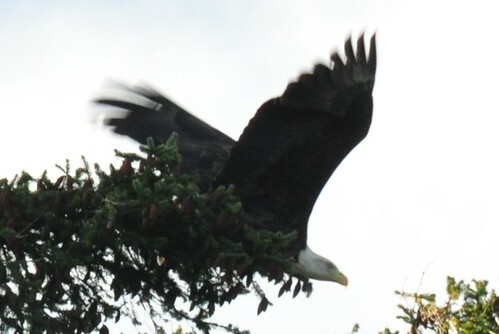 At about 11:15am i was biking down the hill when huge wings to the left caught my eye. 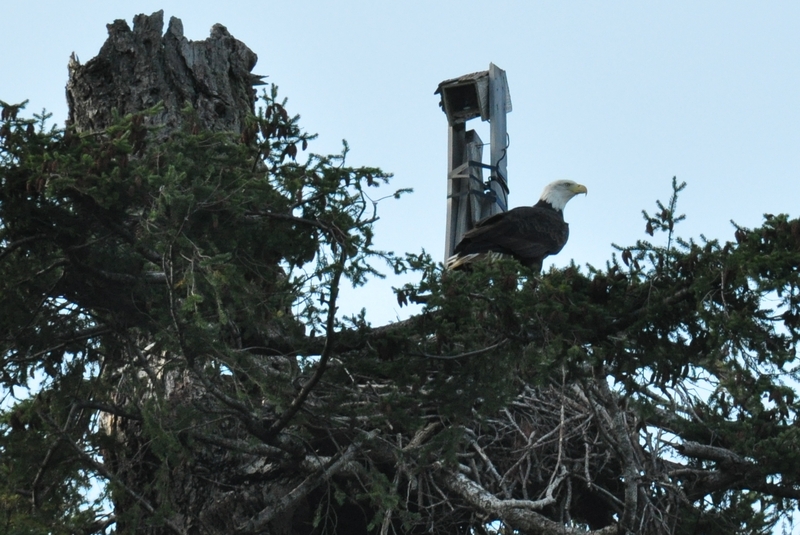 It was Mum or Dad, & their talons were full of streams of long dark wet looking grass. 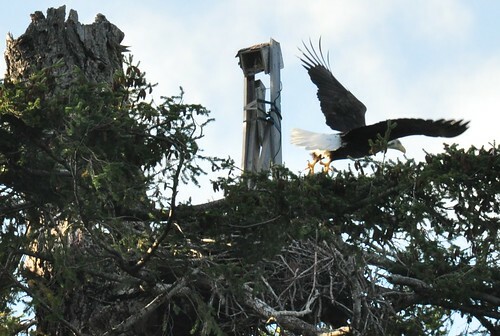 They flew higher up the point, then lower, towards me & over my head, did a small loop over the trees, then headed down the road towards the nest. 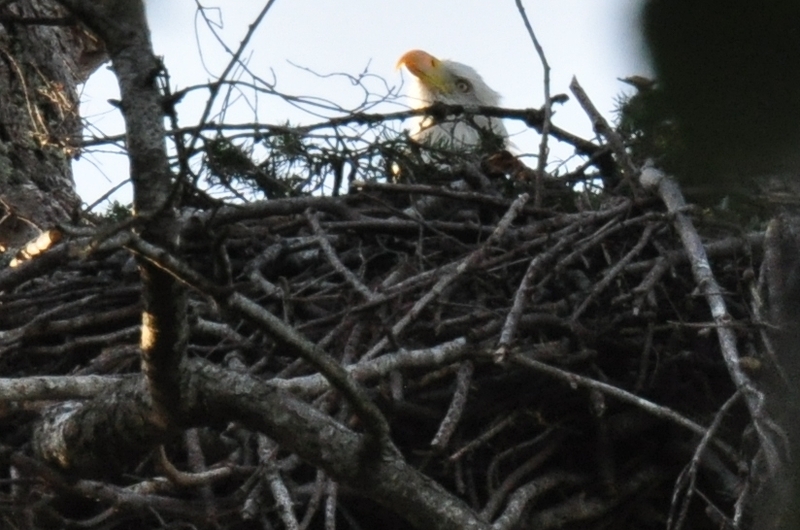 We walked along the beach to The Big Rock & looked up towards the nest tree. 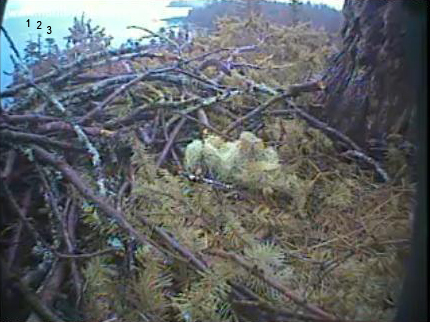 There was Mum or Dad sitting on top of the close up camera, looking out towards the ocean. On top of The Big Rock were at least a dozen black cormorants, some airing their wings, & two seagulls. The tide was high, & the bottom of the Big Rock was under water. 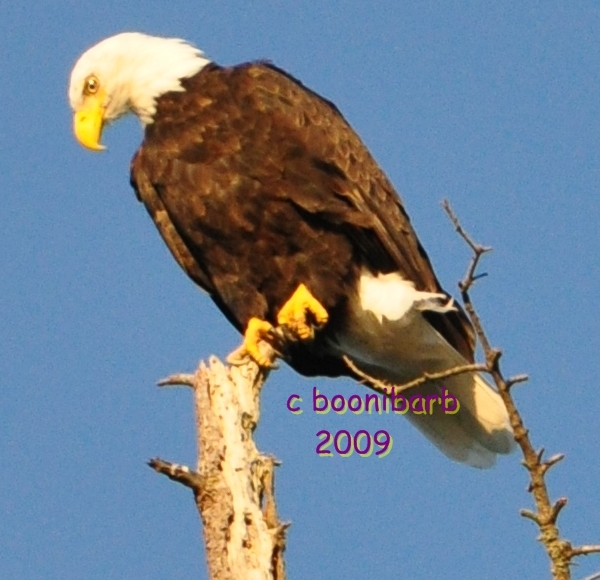 This eagle has some chips missing from their left wing feather tips, the finger feathers on the very tips. Fifth & sixth finger feather tips. Fantastic photo or eagle leaving the nest. The wing span is incredible. If it is still windy there - a quick take off. 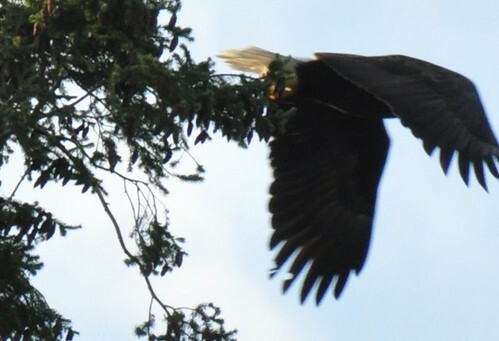 You can see the chips missing from the left wing feather tips. Or maybe the one that just left returned when i wasn*t looking. 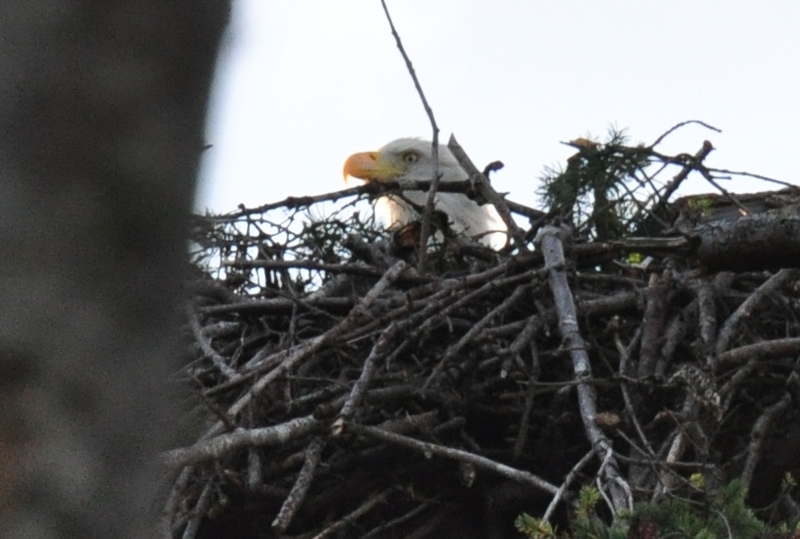 i was getting ready to leave after the eagle flew away from the close up camera when i looked up & saw movement in the nest. 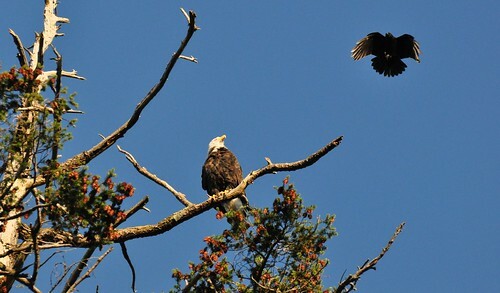 i figured there*d been two eagles there & one flew away. But as Blue points out, when the one in the nest flies away, they have the same chips in their wing feather tips. So the original eagle must*ve returned to the nest without me seeing them arrive i guess. ETA-or the same one has returned & i missed their arrival. He must have snagged those feathers on something. The look on their face is as tho they*ve spotted something.